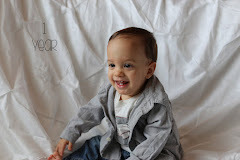 Silly Mommy : Plants, plants and more plants! Plants, plants and more plants! Over here at our house we have decided to go plant crazy this spring. We have become plantin' maniacs! :) This is not how we usually are (we are soooo amateurs), but we have set some goals this year to be more green thumby. We'll see how it all goes. . . I posted a little while ago about how we planted strawberries. Well, a few days ago we noticed little green berries. Hooray! We actually grew something! I was shocked, seriously shocked. Here are Aubrey & Ella realizing what has occured. 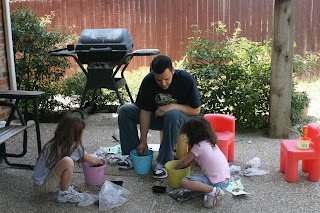 . .
A couple of weeks later, the girls received a package in the mail from Joey's parents(aka Nana & Tata) for Easter. They were these adorable little flower bulb planting kits. 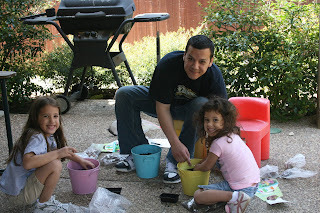 The girls had so much fun putting the soil in their pots and planting their bulbs. 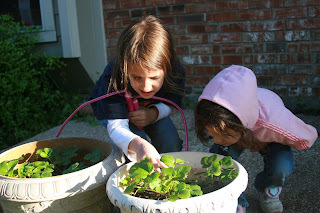 They have been so good about watering their plants and taking care of them each day. They check every day to see if anything has grown yet. Not yet(they were just planted a couple of days ago), but I know they will and they will be beautiful! Thanks Nana & Tata! This was so much fun! We'll post pictures when they start to grow soon. 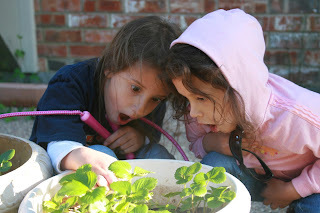 We figured with our professional strawberry and flower planting skills, we should venture into the world of actual vegetable gardening. 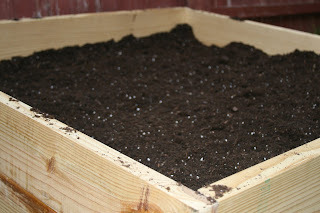 I went to a Relief Society gardening enrichment group a couple of weeks ago and learned about boxed/sq ft/ raised bed gardening. I came home with a vision that night. A vision to plant a successful vegetable garden. I was determined to do it the very next day. You know the feeling when you decide you are going to do something. Nothing was going to stop me. .... .but then I forgot about it for a week or so:) Oopsie. You know how it is. Thankfully, I remembered again on Saturday:) We went to the Home Depot and got all of our supplies, plants and seeds. Tonight we worked on it together as a family and now it sits in our backyard waiting to grow(or die-hopefully not the second option).The kids had lots of fun doing this. We all did. I think it will definitely be something we always remember and I'm happy that we FINALLY did this. Its something we've always just talked about, but we had never put the words into actions. I hope its a success! Wish our plants luck! 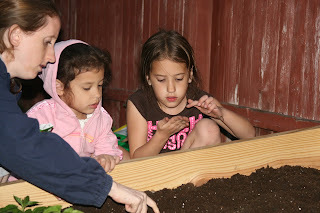 :) Here are pictures of our families very first veggie garden. . . The box Joey built. Good work my strong musclely man. Placement is key. 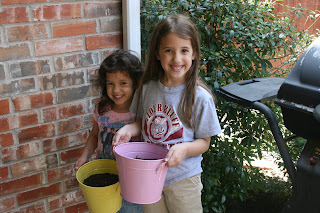 . .
We planted tomatoes, cucumbers, onion bulbs, peppers, cilantro(I think we've got a good salsa garden growing!). We also planted some herbs for me to use in cooking(Yes, I actually cook now. I'm kinda growing up I guess:). Those were all transplants. We also did carrot and green bean seeds. So, most are transplants and we tried a couple with seeds. So, we basically just have to keep most of them alive. . .we took the easier road:) So, there you have it. I'll keep you updated on our progress. Well, unless it all dies. Then I won't update you. That would be embarassing. looks so great. I have wanted to start one of those boxes too, but procrastinated too long. Just think! You will be able to make freezer jam with your strawberries!! !...and you will love having that garden box! well done!! well done! Good job guys! I am so jealous. I really want a garden. I am not talented enough to make anything grow in this barren wasteland. Your garden is great! I have heard about making a garden in a kids plastic swimming pool with holes cut into the bottom, but the wooden frame looks much nicer! Holly, I love reading your blog. Loved the term 'green thumby' -- I need that too. Mark is our outdoor guy and he wants to do some tomatoes or something -- all I know is we have this one rosebush that is just crazy. He hacks it back and it just keeps on coming back and produces beautiful roses through December and January. Me? No talent. The planter box looks great. 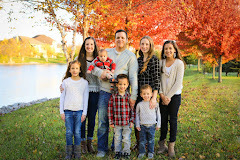 Good job Duenas family. 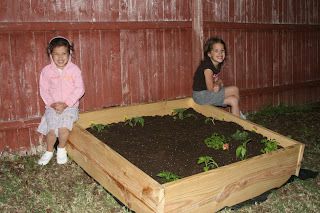 Ella and Aubrey are such cute garden models. Ah, I missed this post earlier when I checked it. Oopsies! I wish I had a place to plant a garden, it looks like fun. I hope they all grow beautifully!!! Yay! Good for you guys! 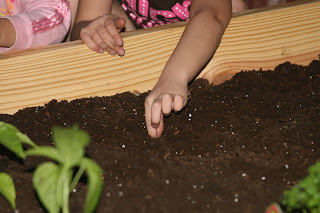 I've always wanted to plant a garden, but we have a hard enough time taking care of what we've already got! Looks like a fun family project, though! Happy Happy Birthday Sarah dear! Enjoying the fruits of our labor. . .
Why are bibs made to be cute? April Fool's AND Happy Birthday to Melissa!